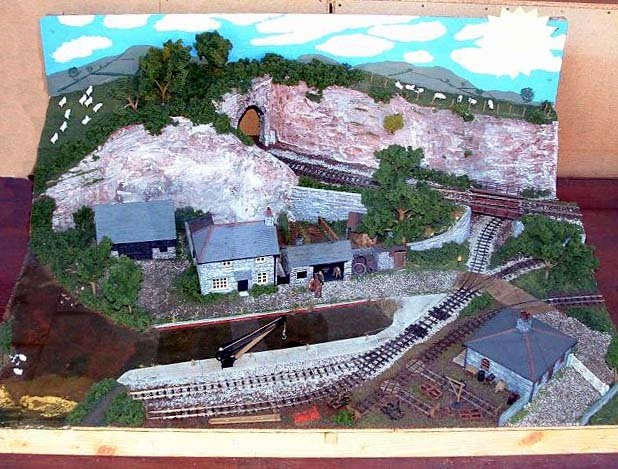 Lummerland is a portable model railway built in Germany by Helmut Heinert and modeled after the characters and scenes in the book, Jim Button and Lukas the Engine Driver, by Michael Ende. The O9 / On15 railway was limited to maximum dimensions of 120×80 cm (4’x2’8″), in order to fit into Helmut’s automobile. The elliptical plan is ingenious, and though fully automatic is not a continuous circuit! Helmut has done a marvelous job of translating the spirit and locale of the book (and subsequent TV series) into a small 1:43 island landscape. 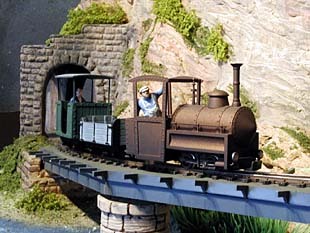 The line’s two locomotives are scratchbuilt, and rolling stock is English from Avalon Models. Wolfgang Dudler took the following wonderful photos of the Royal Koeniglich-Lummerlaendi Rail Traffic Company. The layout is still a work in progress — current structures are just paper placeholders, for example. 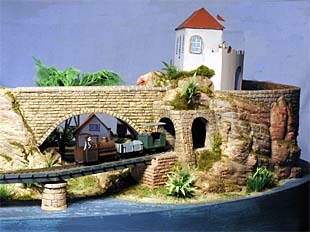 For more information about this charming layout, see Helmut’s web site. Jack Trollope found this attractive little vignette in a model shop window while on holiday in the south of England. He shot this picture through the window. It’s OO9 and OO standard gauge (HO and HOn30). Looks to be about two feet square (60×60 cm). There’s lots to look at in a very small space! 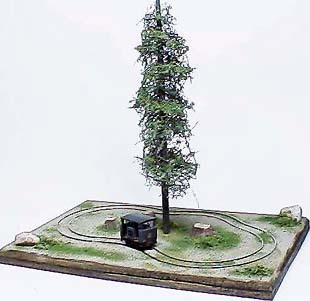 Now take a look at what a seriously small layout looks like! This is HOn2 — gauge is 7 mm. 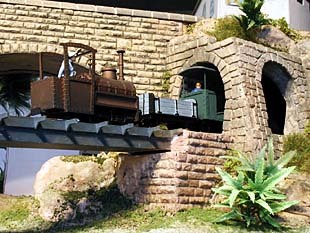 Haruhiko Suga created this tiny “tail chaser” layout to show off the new battery loco built by his friend Hiromi Masaki. The baseboard is 20×15 cm (8″x6″) with a 9 cm radius (3.5″). To see exactly how he built it, including some ingenious and unusual techniques, go to Haruhiko’s web site.